In addition to remodel your operating system on BlackBerry OS 10, RIM also improves its newest BlackBerry device hardware becomes more oke. A leaked BlackBerry devices that use the BB OS 10 circulating on the internet, the latest device from RIM's was called BlackBerry Laguna. BlackBerry Laguna will be launched by Verizon Wireless in the United States, and is the CDMA version of the BlackBerry. 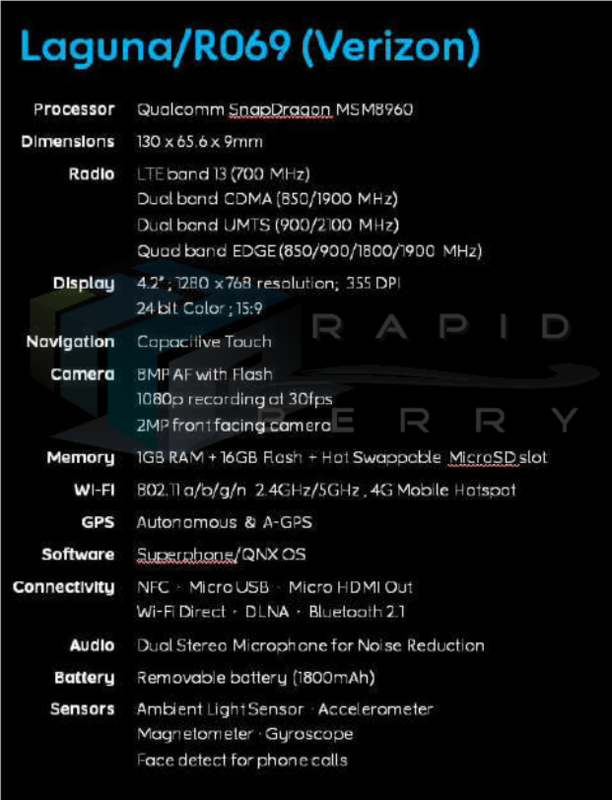 BlackBerry Laguna will be present using the touch screen measuring 2.6 inches with a resolution of 1280 x 768 pixels (355ppi), and was powered by a dual core Snapdragon 1.5 Ghz and 1 GB RAM for Krait. The lagoon is also equipped with BlackBerry camera 8 megapixel camera with 1080p HD video recording capability, 16 GB internal memory plus hot swapable microSD, Wi-Fi and Wi-Fi hotspot, LTE, NFC, microHDMI and port battery capacity 1800mAh.